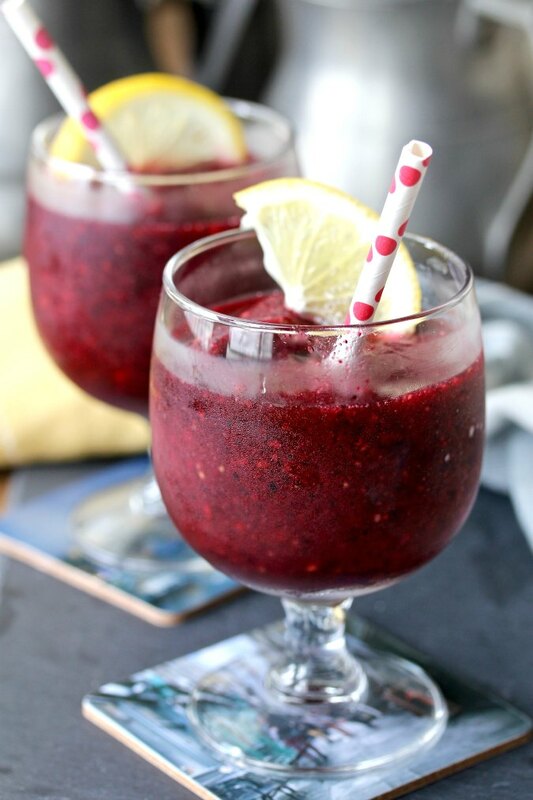 Sangria Slushies: Fruity red wine, brandy, strawberries, raspberries, and blueberries frozen and blended into frosty summer treat. 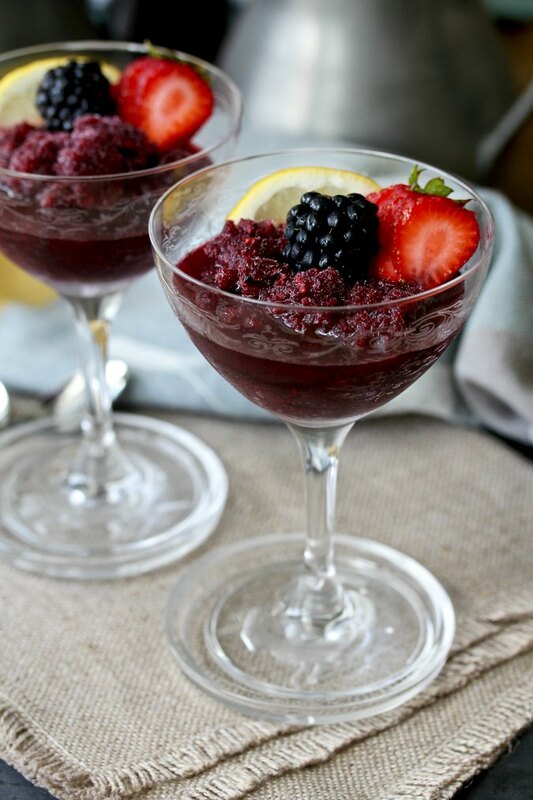 These sangria slushies can be served as an aperitif or as a dessert. They are also perfect for a lazy summer afternoon on the patio, as long as you have no intention to be productive the rest of the day. To make these slushies, begin by freezing fruity red wine in an ice cube tray. I used a silicone ice cube tray that produces large ice blocks, which worked perfectly. 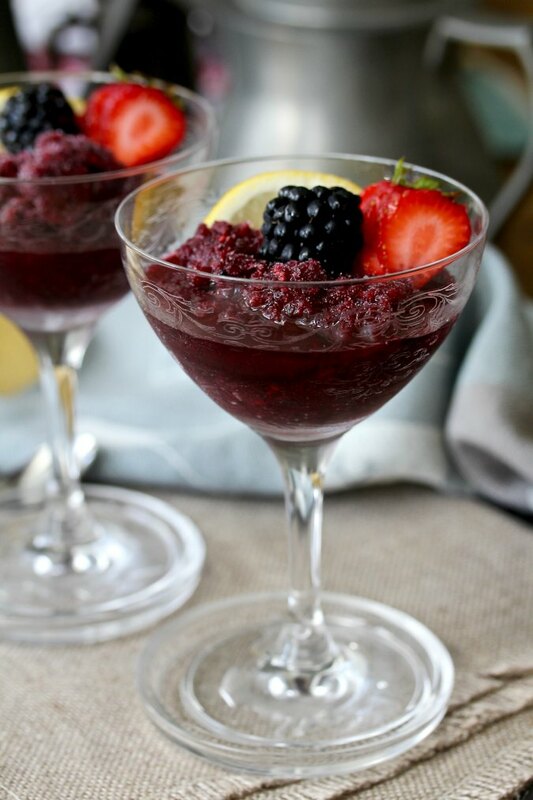 Once you freeze the wine, you add the frozen cubes, frozen mixed berries, and chilled brandy to a blender and puree everything to develop the slushee. You can freeze and blend the ingredients in advance and return the puree to the freezer to serve later. You can also store the puree in a pitcher for cocktails or in individual servings for dessert. Easy peasy. For the wine, use a fruity red wine, one that is low in tannin and not too "oaky." If you are familiar with Spanish red wines, you are in business. 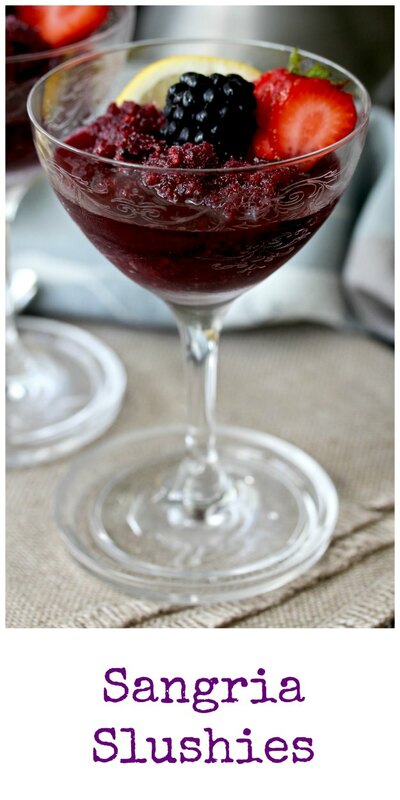 I used a Chilean Carménère for these slushies, which might be a little too Cabernet-like, but it worked. Other recommended red wines include a Merlot, Malbec, Zinfandel, or a Grenache. Thanks so much to Ansh of SpiceRoots for choosing the theme "frozen treats" for this month's Progressive Eats. After the recipe, be sure to check out the rest of the recipes to get you through the summer heat. Freeze the bottle of wine in an ice cube tray until solid. This should take about 12 hours. Combine the brandy and Cointreau and refrigerate. 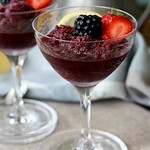 In a blender, combine the frozen wine ice cubes, brandy, Cointreau, sugar, and frozen fruit until slushy. Add the mixture to a pitcher and freeze, or divide among 6 wine glasses, garnish, and freeze or serve. Welcome to Progressive Eats, our virtual version of a Progressive Dinner Party. Each recipe in our menu this month features Frozen Treats - to welcome the beautiful summer months. Our host this month is Ansh from Spiceroots. If you're unfamiliar with the concept, a progressive dinner involves going from house to house, enjoying a different course at each location. With Progressive Eats, a theme is chosen each month, members share recipes suitable for a delicious meal or party, and you can hop from blog to blog to check them out. This recipe is adapted from The Food Network. What a terrific idea! I love how these look!! So creative Karen, I can't wait to make these beauties! Looks very very beautiful! or should I say.... berry beautiful! I made a cocktail slushie once and they are such fun. Of course my intent was to make a popsicle but...it wouldn't freeze! I have to try this Karen, they look positively divine! There you go!!! Thanks Barbara! Cheers! Your photos are beautiful! We love sangria but have never tried it as a slushie. I'm all over this for summer entertaining; it's perfect!